If there’s anything I’ve learned in a career as a musician, it’s when opportunity knocks, answer the #%** door! Raindrop Turkish House in El Paso sponsors an annual late spring trip & a cultural exchange, goodwill mission, sightseeing marathon all rolled into one to Turkey. When my wife, Rachelle, and I got invited to join a group of five, making seven total, we couldn’t pass it up. I could bring my guitar and perform (my contribution to the cultural exchange), get shown around the country with the help of Sabri and Riza from the Raindrop House, check out Turkish music (always a fascination), hear Turkish musicians, see Turkish instruments, all while traveling in a predominantly Muslim country (about 90 percent), something that neither Rachelle or I had ever done before. That was a short list of what we were expecting, but it wasn’t a fraction of what the adventure turned out to be. Also, Erkan Ogur, my favorite musician, lives in Istanbul. One of my reasons for going would be to meet this great player. Would he be in the country at that time? Who had the connections to set up a meeting? And would I have time to search for a good Turkish saz (a long-necked stringed instrument)? Both of these quests would put me in situations I couldn’t have even imagined a month before. This trip was not for the faint of heart, nor the weak of limb. We worked. We visited hospitals, schools, a TV station, a writers’ co-op, universities an endless list. Our hosts would talk, show us around, obviously proud of their facilities. We would ask questions, and maybe tell them about life in the States. Really though, I was more interested in learning, in soaking up what I could, especially with music. I lost interest in playing guitar halfway through the trip. I wanted to get some insight into how these musicians thought; what all those little quarter tones in between our 12 notes in the western scale meant to them. In Turkey, I became the student. My first interactive musical experience, besides buying an Omar Faruk CD, was jamming with a baglama player in the back of a carpet shop in the coastal town of Kusadashi. I played a darbuka, a Turkish drum. A baglama, I was learning, is what you call the short-necked version of the saz. We played for an hour while another in our party, after a thoroughly entertaining sales demonstration, mulled over the decision of exactly which Turkish carpet to buy. When I said to my playing partner that I was looking for a baglama, he was more than willing to part with his, which his father had given him, by the way. I didn’t know enough about baglamas yet to tell a good one from a tourist one, so I passed. One thing I did learn was that these guys are wheeler-dealers. If you like to bargain shop and haggle, you’ll be right at home in Turkey. I loved it. Riza thought I must have some Turkish blood, although I figure it’s the Scot in me. Scots are a traditionally frugal lot. Before I wrap it up for this episode, I’ve got to mention the Whirling Dervishes in the town of Bursa, and ezan, the five-time daily Islamic call to prayer. Witnessing both were life-changing experiences. The dervishes define the word “trance,” a half-hour graceful spin to a haunting musical accompaniment. There is your life before and after the dervishes. 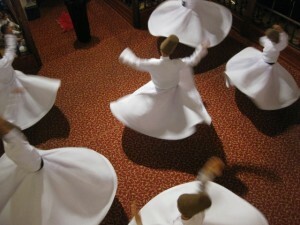 If the dervishes define trance, then ezan defines “haunting,” at least to these western ears. Picture lying in bed, 4:30 a.m., with short, amplified calls echoing around the city. The calls are variations on a theme, with the caller leaving space at the end of each phrase for the echo to bounce around, then evaporate. The effect is that the whole city becomes a musical instrument. It’s not considered music it’s a call. But I’ve rarely heard anything so musical; it finds its way into your bones. Next column: baglama and Erkan Ogur.